Repat is to Expat as Repatriate is to Expatriate. I like words and word games and analogies! 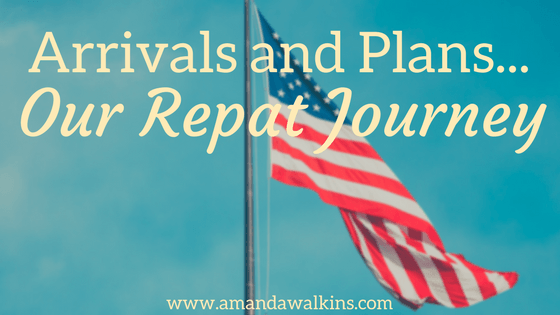 A repat is merely someone who has repatriated, moved back to his or her country of citizenship. As mine is the U.S., we are, obviously, currently stateside! I am technically the only repat here since my Irish-Colombian does not have another hyphen with “American” in his list of nationalities. Although, he did spend two years here as a child, so it’s sort of a mini-homecoming for him as well. Granted, that time was spent in California – a far cry from the Boston area in winter! Our repat journey will not be forever. In fact, this is merely another stopover in our ever-growing list of stopovers in recent years. There was the three-month layover in Ireland and the five-month expat experience in Malta. And, now, we’re looking at another six months here in the U.S. The primary reason we came to the States was down to scheduling. We intended to be here for the holidays this year, having spent the previous two in Scotland together. When we found out the Irish-Colombian’s dive shop in Malta would close for all of January anyway, we figured we would just stay the extra month before returning to Malta in February. But, then, we were reminded of our age. At this point in our lives, there are no years without weddings. I’ve returned to the U.S. several times throughout my expat years to attend and to be in multiple weddings, and 2017 is no exception to that trend! This time, my lovely friends and family ever so thoughtfully planned three weddings within five weeks so that we could be sure to attend them all! Given their proximity to the holidays and our intended longer-term stay anyway, it just didn’t make sense to make several transatlantic flights and pay for a flat back in Malta that would be empty for months on end. We’re spending time with my family and friends, we’re exploring New England in autumn, and we’re making no attempt at future planning (yet). We’ve been Stateside for just over a month. But it’s not just weddings and holidays and being the youngest retirees ordering the early bird special for us! We have big plans for plenty of fun and adventure while we’re here, too. But before we get into all the details, here’s a quick rundown of what we’ve done since arriving just 6 weeks ago. First things first, we attended a wedding. And then we took care of my fluffy cat neice for a week. And then I was a bridesmaid in a wedding. And then I was a bridesmaid in another wedding. After that, we did a fabulous housesitting gig with cats and chickens! I’ll post about that someday, but in the meantime, you can check out my Instagram posts because these cats were so. fluffy. and. cute! Autumn in New England is truly something special, so we’ve been taking advantage of all things pumpkin, apple, and Halloween! Walks in the woods, admiring the changing colors, and enjoying the beautiful scenery have all been mainstays thus far. Coming up soon, we’ll be visiting Washington, DC, to catch up with all my friends and family there. After that, it’s Thanksgiving in Massachusetts. I’m not being cliche here, we actually spend that holiday sharing a meal in Plymouth…a la Pilgrims. Plymouth is a family stomping ground for us, so you might get the added bonus post of Plymouth and Plimoth highlights (do you know the difference? #historynerd). We have no definitive plans beyond November, so everything is an option right now! Holidays with family, celebrating another anniversary, and then making plans for wherever the wind blows us next will all be figured out in time. If you have suggestions for anything we can’t miss in New England between now and March, I’m all ears! Except, please note, I turn into an icicle far too quickly so you can hold onto your skiing and other winter sports advice…sorry, I’m a sunny, warm vibes kinda gal! Speaking of sunny, warm vibes, please keep the Caribbean islands in your hearts and minds. While the hurricanes that caused so much destruction and heartache have passed, the recovery will continue for a while. That’s it for now! Updates to come when and where I can. Cheers to another adventure!